The OFPPC 5100 Open Frame Panel PC series of Embedded PC is designed for harsh industrial environments. 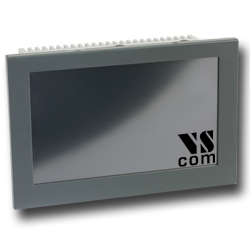 It features fanless and cableless construction, low power consumption and operating over wide temperature ranges. Its reliable design allows to withstand mechanical vibrations, hot or cold environments, power failures or environmental electrostatic discharges. The OFPPC 5100 series has a modular and reliable design based on the newly emerged standard of Qseven core modules. The Open Frame embedded systems support Intel's Atom D525 high performance CPUs. The OFPPC 5100 series integrates many standard connectivity devices in a compact construction, all connections placed on one side only. Available are double Gigabit LAN, USB, RS232/422/485 serial port and optionally WLAN, Bluetooth and a parallel port to match different industrial application requests. GSM/3G or GPS function are other options. The complete OFPPC 5107 system is mounted on the back side of a 7" touch panel display. A heat spreader with cooling fins protects the back side of the construction. The OFPPC 5107 boot from an internal HDD or SSD, or even from a SD memory card in the internal slot.